The question arises of when should you draft your QB and is Peyton Manning worth it and can he repeat in 2014? Let's first take a look at the numbers; Peyton Manning cleared 406 fantasy points (using a standard scoring model and if your league has a custom scoring model that downplays QBs then this article is not as relevant) followed by Drew Brees at 348, then the rest of top 10 had 282-253 fantasy points. Peyton Manning was a true difference maker in 2013 and Drew Brees was not too far behind. Peyton Manning will not toss 55 TD's again in 2014 but you have to give Peyton Manning and Drew Brees some real consideration for your first round pick since they do have the potential to be such a considerable difference in fantasy points to the next QBs. I would argue that if you are not going to get Manning or Brees then you wait until round 4 or 5 for your QB draft. QB #3 through #16 scored between 282 to 225 fantasy points. Most owners will not start drafting a back-up QB until after round 5 so you can just sit tight if you don't get Manning or Brees. Aaron Rodgers should be considered as a top 3 QB but it appears Green Bay has finally found a running game and it's hard to believe Rodgers will throw over 340+ fantasy points in 2014, but you can gamble if you want. Peyton didn't lose much of anything coming into 2014 and in fact I would argue that he has a better group of WR's this year and potentially the same ground game as well. 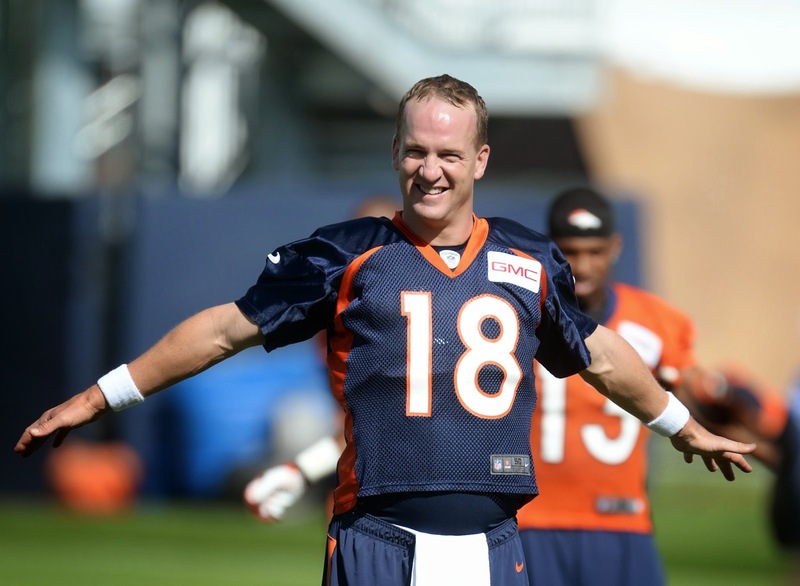 So the question remains do you think Peyton can do amazing things in 2014? Drew Brees has shown time and again that he is a safe QB to draft and if he is there in round 2 of the draft I would have a hard time not picking him up. If Peyton is available with your first round pick he appears to be a safe option going into 2014 that he can throw over 340+ fantasy points and show a clear differentiation between the #3 through $16 QBs. If you do draft Peyton with your first pick and people give you a hard time, then shake it off and remember the numbers. Numbers talk and haters walk.